White enamelled steel, with liquid measurements marked inside. 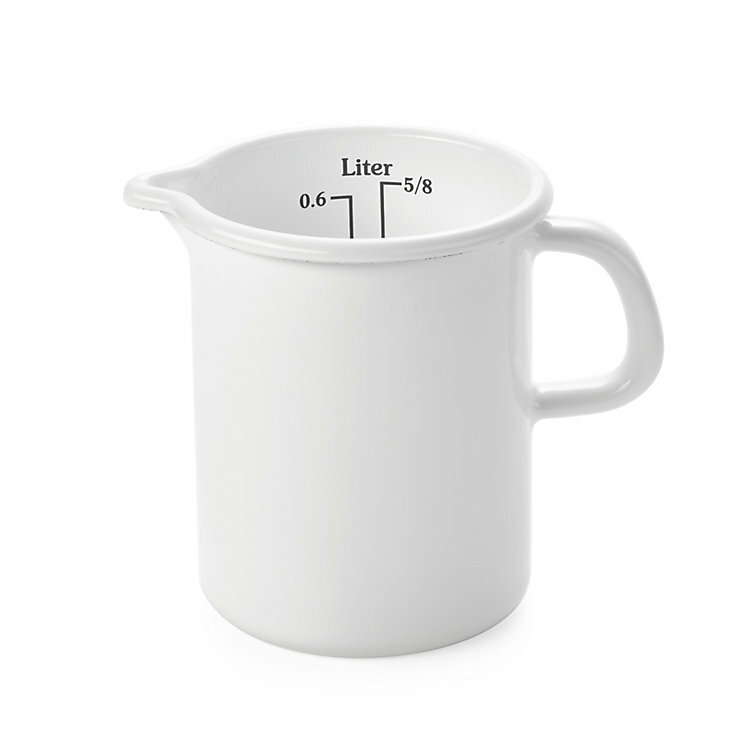 Small: Measurements from 0.1 to 0.6 l in 100 ml gradations, as well as 1/8, 1/4, 3/8, 1/2 and 5/8 l. Volume 625 ml. Ø 10.5 cm, height 12 cm. Weight 315 g.
Large: Measurements from 0.1 to 1 l in 100 ml gradations, as well as 1/4, 1/2, 3/4 and 1 l. Volume 1 l. Height 15 cm, Ø 11.5 cm. Weight 445 g.
Glass Hard. Pots and Pans from Lower Austria. Enamelled pots and pans are basically steel utensils coated with silicate glass. The glass-hard surface of enamel is amazing: it is safe for use with food, tasteless, corrosion-resistant, scratch-resistant, heat-resistant, and easy to clean. We offer cooking utensils in a particular colour combination: black on the outside and cobalt blue on the inside. These were the colours once exclusively reserved for cookware and cooking utensils used by professional chefs. Measure, Stir and Heat Up. Made from enamelled sheet metal, these measuring cups from Riess in Austria are suitable for heating liquids on the stove at low heat, such as milk (or water) for yeast dough or broth for risotto, making it easy to check that the exact quantity called for in a recipe is used. The measurement markings inside are black on white, and easy to read.